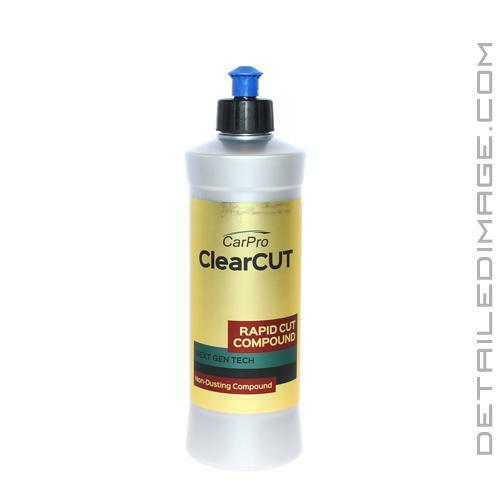 The CarPro ClearCut Compound helps you safely and easily remove medium to heavy imperfections from your paint. When using a heavier pad/polish combo we often times find ourselves polishing the area, wiping away, checking our work, and polishing again as needed. When you remove imperfections in one pass, this is great, but sometimes you have to repeat the steps one, two, or three times before you are satisfied. With ClearCut, you will not only have the power to remove many heavier imperfections, but the high-end formula was made to be transparent. Why is this important, well now you will be able to see the imperfections polished away while performing the polishing step. No more stopping, wiping away, inspecting and repeating as necessary, you will have a Clear view of the Cutting produced! ClearCut removes p1000 grit sand marks, saves time, cuts fast, low dusting, and contains no fillers making it body shop safe. Use with various foam pads and rotary or dual action polishers. After use, follow up with a lighter pad and polish combo like the CarPro Reflect. Stop wasting valuable time, compound with the CarPro ClearCut! Move to next section. Apply 6 - 8 pea size drops to pad and repeat steps 2-7. My initial impressions show that, so far, they have achieved what they set out to do creating a cutting compound that can effectively remove moderate to heavy scratches and swirl marks with low dust and a translucent working appearance allowing you to see your work. I am glad to have this in my arsenal. 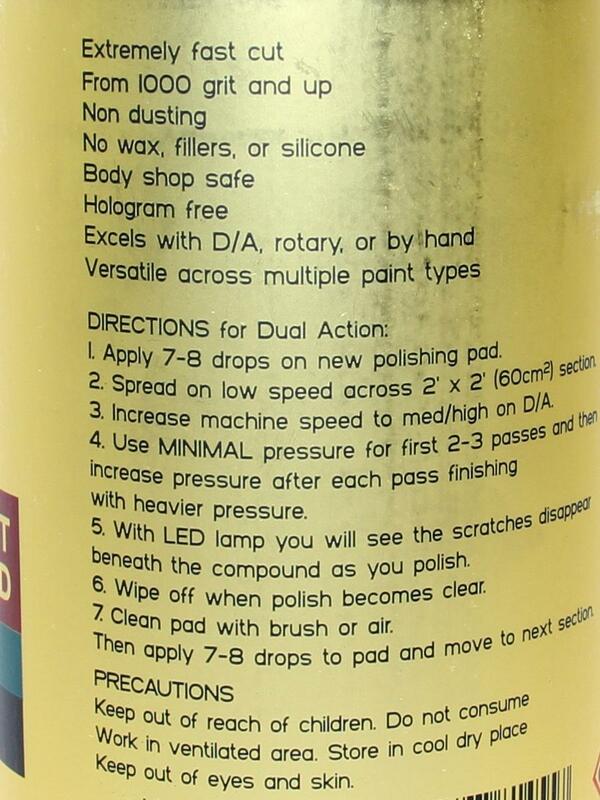 Apply 7-8 drops on new polishing pad. Spread on low speed across 2' x 2' (60cm2) section. Increase machine speed to med/high on D/A. Use MINIMAL pressure for first 2-3 passes and then increase pressure after each pass finishing with heavier pressure. With LED lamp you will see the scratches disappear beneath the compound as you polish. Wipe off when polish become clear. Clean pad with brush or air. Then apply 7-8 drops to pad and move to next section. Became my favorite cut compound! Low dust and the results achieved are phenomenal when paired with the right pads! I follow it with Menzerna 2400 or CarPro Essence and I get a perfect finish! The gloss you obtain from it is amazing! Highly recommended. My current favorite. No dust and extremely easy wipe off. Haven't found a paint it hasn't performed great on.